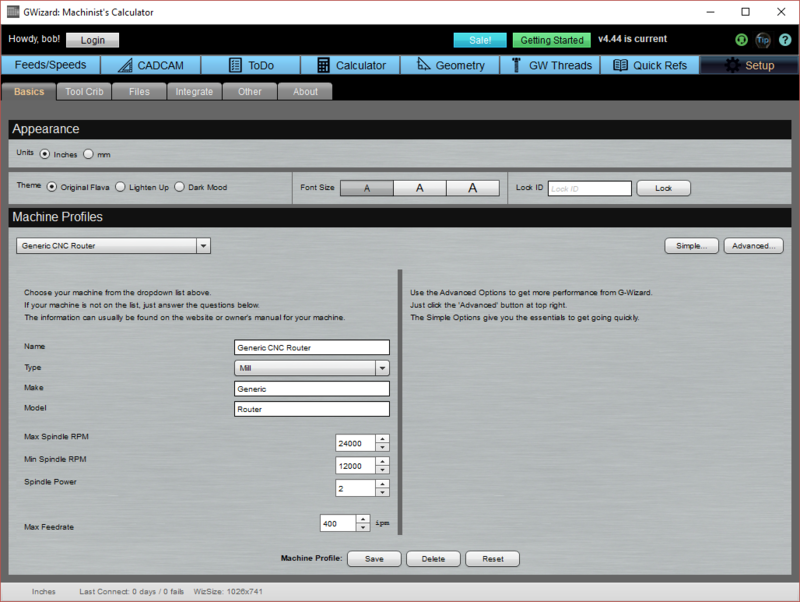 G-Wizard Calculator is designed to save you time by providing you with a variety of reference materials every machinist and engineer should have when on the shop floor or in front of your CADCAM software. In addition it offers the most advanced Feeds and Speeds calculations available anywhere. Everything you need to get started with G-Wizard including how to login, setup, and start using Feeds and Speeds. 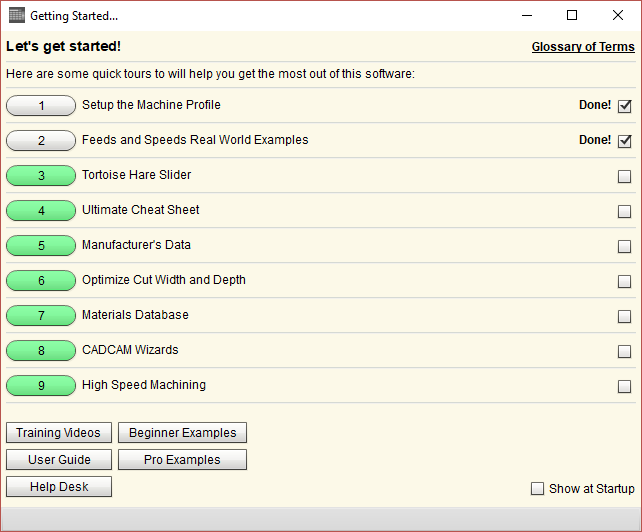 The Getting Started Tours that are built right into G-Wizard are your best bet for learning the software. The Getting Started Tours will pop up every time you start G-Wizard until you uncheck the “Show at Startup” box in the lower right corner. You will not be able to suppress them until you’ve at least completed the “Setup the Machine Profile” tour. Each is designed to provide you with a quick (5 minutes max) tour of the specific area. We recommend taking the tours in order, but you can do them any way you want. The Getting Started popup will remember which tours you’ve already taken for you as well. If you’re a trial user, try to do all 8 tours as soon as you can, because they’ll equip you to get the full value out of G-Wizard. Training Videos: This is our G-Wizard Video University, which has a variety of quick videos to help. Help Desk: Our Help Desk page, with download links, customer service, and much more. Lastly, there is a Glossary link at the top right. This is a special glossary I put together for CNC Beginners that has all the special Feeds and Speeds-related terms you may want to know the meaning of. Note that all of the buttons pop up content in a web browser. If nothing happens, you likely are running some kind of popup blocker that prevents us from helping. Just getting into CNC? Finding the terminology a bit confusing? We’ve put together a glossary that covers every technical term used in G-Wizard Calculator. In addition, it tells you which terms Beginners should just ignore. Handy to have. – G-Wizard Calculator Video University: A series of quick videos to introduce you to the various functions of the software. – How-To Articles: An index of our best How-To articles for G-Wizard Calculator. – For a more in-depth walkthrough and demonstration, download the latest recorded webinar from our webinar page. The recordings are at the bottom of the page. – Try our Help Desk. Just click the “Help” menu at the top of any CNCCookbook web page. – Login Area: You can press the login button to logoff or change your login. Most users just leave G-Wizard logged in all the time. – Getting Started: This button pops up the “Getting Started” Tours. They provide step-by-step tours of all the most important functions in G-Wizard. The App Selector selects which applet is displayed in the Applet area. Anyone can access most of the applets, but Feeds/Speeds and CADCAM Wizards require either an active trial or that you have paid for a subscription to G-WIzard. – User-Definable Machine Profiles tell G-Wizard what your CNC machine is capable of. – Extensive Features to Use Manufacturer’s Recommended Data. Mfg’s Data can be used on the fly or databased with the Tool Crib. – Tips that Bring Important Information from Manufacturer’s Data Sheets Straight to Your Specific Cutting Scenarios. G-Wizard Will Remind You of Everything from When to Use Climb vs Conventional Milling to When Parabolic Flutes are Needed for Hole Drilling. – Our Exclusive Tortoise-Hare Gas Pedal Slider Lets you Decide Whether You Want Aggressive or Conservative Cutting and Whether to Emphasize Maximum Roughing Speeds or Focus on Tool Life and Surface Finish. – Exclusive features for CNC Routers and CNC Lathes that are not available anywhere else. 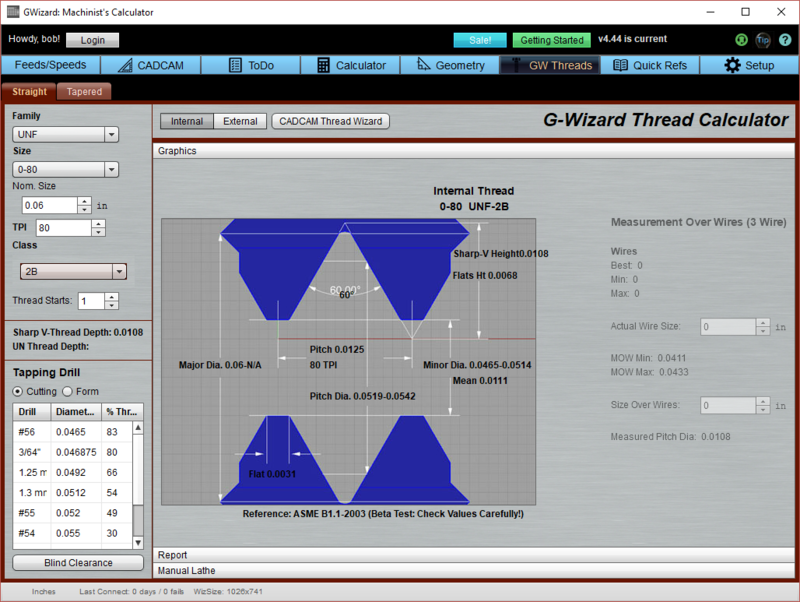 CADCAM Wizards are a unique feature to G-Wizard Calculator that provide the next generation of Feeds and Speeds. Their purpose is to radically simplify calculation of feeds and speeds while at the same time giving much more optimal answers. 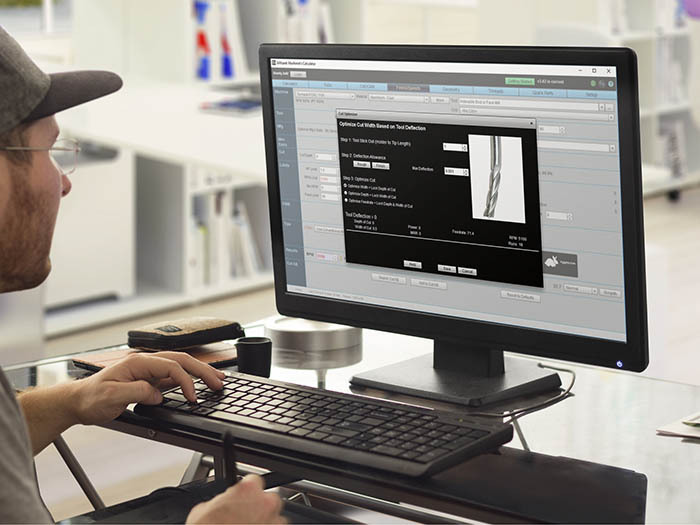 Whether you’re a beginner or an expert CNC’er, CADCAM Wizards can give you a complete machining recipe for your CAM software that can dramatically reduce your cycle times and improve your results all while requiring a lot less data input than conventional approaches to Feeds and Speeds. Conventional Feeds and Speeds starts with questions like what kind of tool you want to use and what cut depth and width would you like. 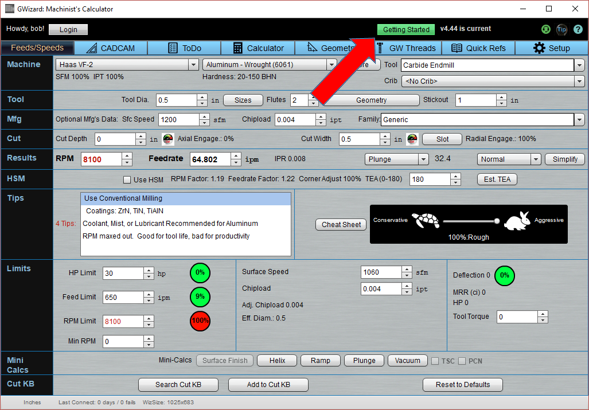 CADCAM Wizard “thinks” like your CAM software, so it starts with which CAM operation you’d like to perform–pocketing, 2D profiling, Holes, Face Milling, and so on. When you’ve given it the basics, it tells you what it thinks the best cutter, cut depth, cut width, and other parameters would be. It also provides a detailed estimate of the time it thinks the operation will require. 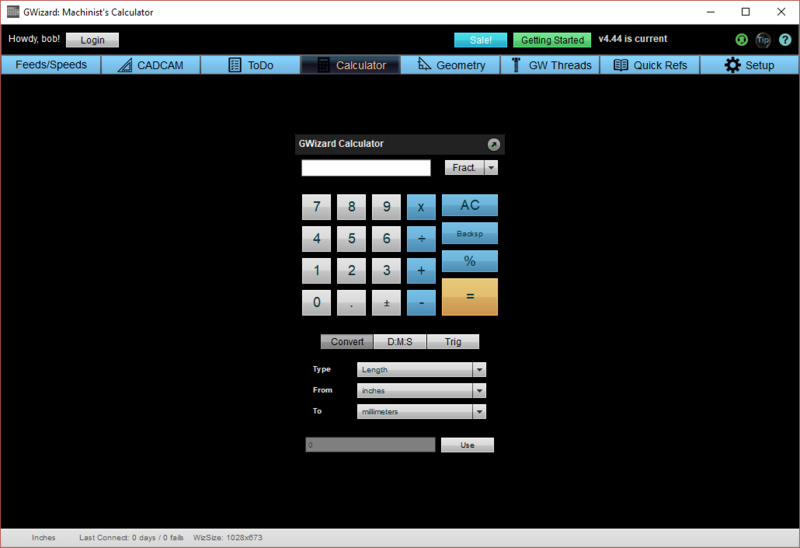 While you may have purchased G-Wizard because it has the world’s best Feeds and Speeds Calculator, don’t overlook CADCAM Wizard, which can give you even more, and which is built on the very same Feeds and Speeds calculation engine. CADCAM Wizards can save you time and money. 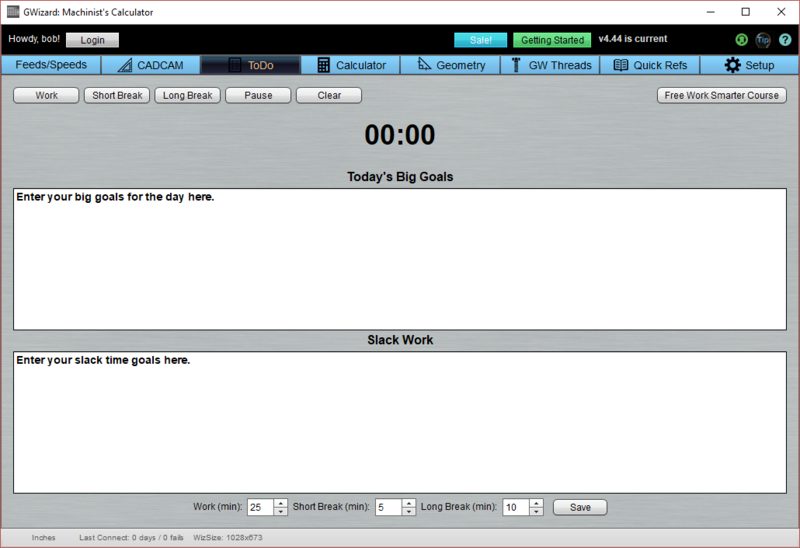 G-Wizard’s ToDo productivity applet uses the proven Pomodoro technique to make you more productive during the workday. We even offer a complete free online video course called “Work Smarter” in how to maximize your personal productivity. Just click the button at top right of the ToDo applet to access the course. Calculator is a Full-Function Scientific and Engineering Calculator. Since it can be handy to have available while using other functions, there is a handy tear-off feature that lets you pop the Calculator loose from the G-Wizard window. Just press the little arrow in the top right corner of the Calculator. There’s even an ISO Fits and Tolerances Calculator and a Turner’s Cube Calculator. In addition to dimension information on the threads, you’ll find tapping drill information that includes a chart of thread percentages so you can choose the best tapping drill for your application. 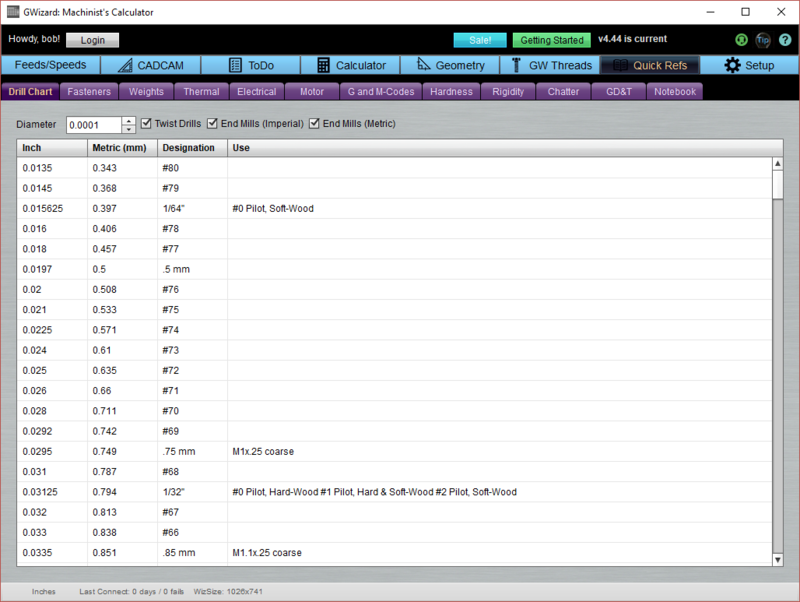 There are two versions of the Thread Calculator–Free and Premium. The Premium Version has a lot more Thread Families and features. – Drill Chart shows all the standard drill sizes and their uses. – Fasteners gives a handy database of common fasteners and their dimensions. 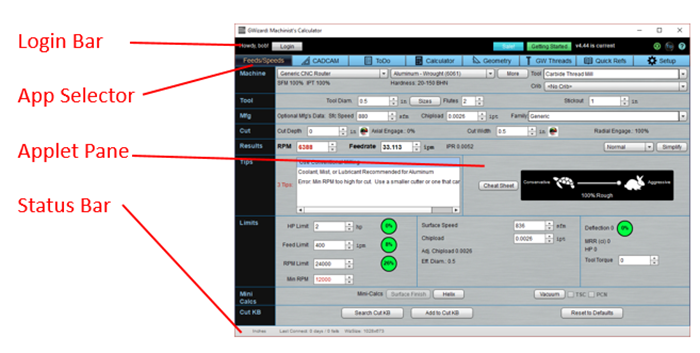 – Weights calculates weights and volumes of work materials and includes all the standard sizes they’re available in. – Thermal calculates thermal expansion and contraction to help you ensure accuracy in your work. – Electrical is a grab bag of useful information for electrical work including resistor color values and an Ohm’s law calculator. – Motor helps do CNC servo and stepper motor-related calculations. – G and M Codes provides handy reference tables of common G- and M-Codes for CNC programming. – Hardness cross references all the different material hardness systems to help you convert from one to the other. – Rigidity helps you evaluate trades offs in your tooling selection related to rigidity to help you keep chatter and tool deflection under control. 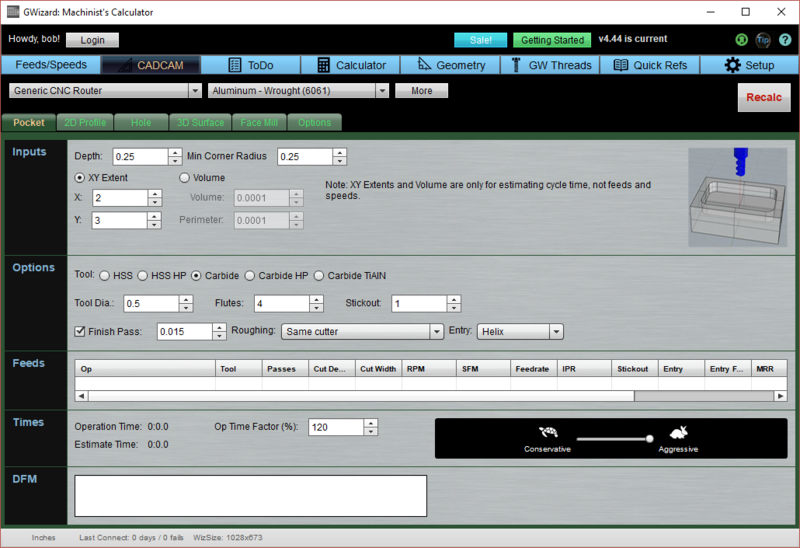 – Chatter helps you calculate spindle rpm ranges that will minimize or eliminate chatter from your work. – Notebook is there for all the things we forgot to add. It lets you bookmark resources on the web and pdf files on your machine so you can bring them up for reference in G-Wizard too! – Units: What unit system would you like to use, Metric or Imperial? – Machine Profiles: Tell G-Wizard the capabilities of each of your CNC machines. If you hadn’t noticed, G-Wizard has a lot of functions. You’re probably wondering what to do next to master all of that power. 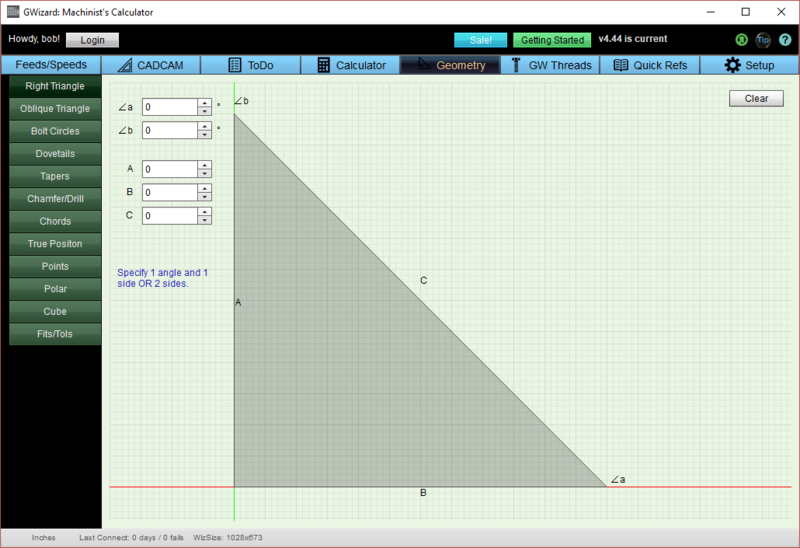 The short answer is, you should dive in and start using G-Wizard Calculator! But, there’s at least one thing you can do to help make that smoother, and that is setting up Machine Profile for the different machine tools you’ll be using. It’s not hard to set up a Profile–just a matter of giving G-Wizard some basic specs on your machine such as spindle power, maximum and minimum rpms, and the like. To find out more about how to do that, visit our Setup Page. The other thing you’ll learn to do is set G-Wizard’s units to be either Metric or Imperial. The product includes full support for both systems. Once you’ve got a profile in place, you’re ready to start using all the Applets. There’s links to more information about each one over in the lefthand column. We suggest exploring them in left to right order, as they appear on the App Selector. We’ve chosen that order because we think that’s the best order of frequency and simplicity. – GW Calculator Documentation: This is the home page for it and the other pages are accessible via the links on the left. If you forget to bookmark this page, you can always get here by clicking “Getting Started” on the GW Calculator Login Bar. If you’re using an Applet and need help, try clicking the Help button on the login bar. It’ll take you to the documentation page for that Applet. – Install Page: From time to time we’ll be releasing new updates to the software. You’ll see an indication in the Login Bar when one is available. There’ll be a button there you can click to go to the Install Page, or you can click the link on the left to get there. – Email Newsletter: If you haven’t already, be sure you sign up for the G-Wizard Calculator Trial. This will cause a series of emails to be delivered to you every few days that contain links to our best articles on how to get the most out of GW Calculator. – CNC Blog: CNCCookbook has the most popular CNC related blog there is. We get over 2 million visitors a year checking out the information there. Every time there’s any kind of update or tip or technique for any of our software, I write it up first as a blog post. You can get a digest of all the posts once a week by singing up. The articles cover all aspects of machining, but I have created categories that make it easier to find the subset of articles by topic. The two categories that will be full of information for G-Wizard are Feeds and Speeds and Software. It’s worth your while to at least scan these and see what’s available there. – Feeds and Speeds Course: CNCCookbook has a free comprehensive course on all aspects of Feeds and Speeds that contains a wealth of knowledge as well as lots of examples on how to use G-Wizard to solve your problems. Even if you just read one article there a week you’ll rapidly add to your store of useful machining knowledge. – CNC Manufacturing Course: We also have a free course on CNC Manufacturing. It’s a little higher level than Feeds and Speeds, but if you’re using the G-Wizard Calculator, there’s likely a lot of useful material there for you. – G-Code Course: If you’re in CNC and you’re not comfortable with g-code, try our free g-code course. It’ll get you up to speed quickly and painlessly.